The Crown is a fantastic drama series exclusive to Netflix subscribers. Here are all the ways you can watch The Crown. The third season will air sometime in 2019. Have you watched The Crown yet? Here are the ways on how you can be updated, your Royal Highness! Queen Elizabeth II, one of the most powerful monarchs in the world, is a woman of many mysteries. Netflix’s original, “The Crown,” centers on the life of Queen Elizabeth II (played by Claire Foy) from her younger years to her rise as a powerful monarch, as well as her relationships with the people that she dealt with during her reign. It’s a roller coaster ride to the throne as there are tons of drama, emotion, and all-around great acting involved! The first season was released on Netflix on November 4, 2016, and is currently running at 20 episodes at an hour each. Netflix has the official license to air The Crown, but if you want to binge-watch on this classical gem on some other sites, scroll down below for our list! Streaming this show isn’t particularly difficult, but there are some pitfalls to avoid. Like any other show, you should first take a look at the official ways of watching The Crown. By doing this, you ensure that shows like this keep getting funded and produced! Heads up! The Crown is only available on Netflix. 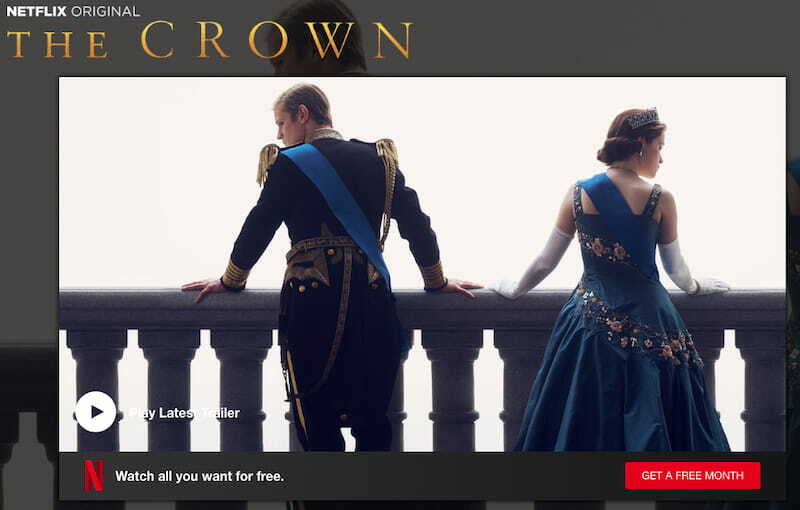 The Crown is licensed only under the Netflix brand, with all 20 episodes up for grabs. It’s a logical choice considering that Netflix (as we all know it) offers one of the most optimized streaming services in the market today. 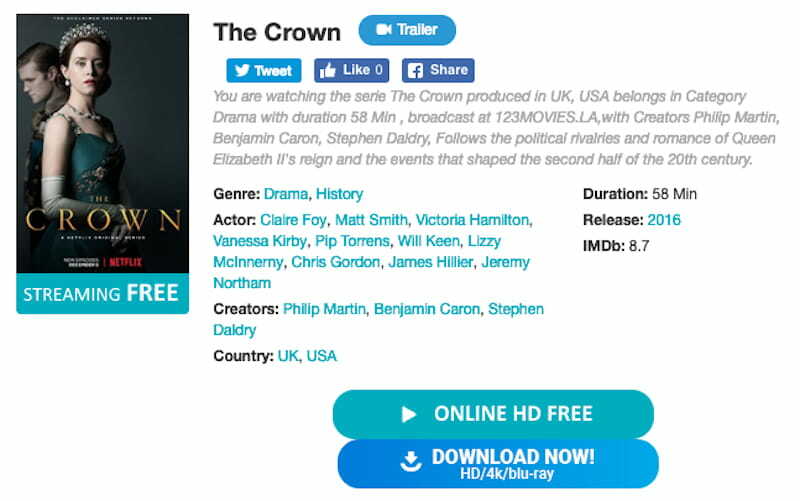 Viewers can choose to stream the Crown on its website on SD, HD, and even Ultra HD at a very affordable pricing range! Now if that’s not convenient enough, then we don’t know what is. Alternatively, if you can’t stream the show, no worries. Just download the Netflix app which is available on iOS and Android devices and you’re good to go. It saves you a lot of time especially if you’re always on-the-go or traveling. Other than that, you also get to view other exclusive titles which are also licensed on Netflix. But, as with all streaming platforms, there are geo-restrictions. As such, not all titles are available for streaming for some regions. What’s relieving is that there’s a way to watch The Crown or other titles even if it’s locked in your region. How? Through the use of a VPN! If you want to have a go about setting it up, we’ll gladly tell you everything you need to know. Just scroll down below. Here are some alternatives we can recommend for watching The Crown. However, not all these are guaranteed to work so expect some hiccups along the way. As you may know, streaming through these sites is entirely legal in some sense as long as you’re not downloading, uploading, or sharing the material through p2p platforms. But it’s also your responsibility to make sure that you know your local laws and abide by it if it’s prohibited. When it comes to alternatives, Dailymotion is a safe bet. In case you didn’t know, YouTube has strict copyright infringement policies that are only getting tougher by the day. They do not allow streaming of material which is illegally uploaded on its site – so you might have trouble finding episodes of The Crown on it. Dailymotion is like YouTube but with less censorship. Its policies are not so stringent so some videos slip on its system. Try clicking on the links and see what you can find. We’ve noticed that there are some episode gaps so you will definitely be frustrated trying to look for all episodes here. Try 123movies for episode gaps on Dailymotion. You probably know 123movies as another alternative streaming platform. Its library of TV series is no joke, and its following of around 90 million make it a hub for people who want to watch apart from official streaming platforms. Its interface is simple – you type the series you want to watch on the search bar then try out all the links provided. However, we’ve noticed that there are also lots of episode gaps on this one so if you’re up for the task, juggle between this and other alternatives we’ve mentioned to find what you’re looking for. In addition, it’s filled with lots of infected and blank links, so be careful. If you’re worried at all, just stay away. Vmovee is also one alternative. Netflix shows are tough nuts to crack, so other streaming sites find ways to host the content to make it available for people who can’t afford to subscribe to Netflix. Vmovee may not really be as famous as its other counterparts but it can work as well. Obviously, you won’t find all episodes here and you can surely expect viruses. Not all these methods are guaranteed to work, so if you’re out of alternatives, you can always try Google and type on the search bar what you’re looking for. All in all, it’s good to have alternatives to official streaming platforms such as these, but always bear in mind that when you stream from unofficial sites, harm will come eventually not only to your device or your computer but also to your privacy. If you value your anonymity, follow our advice and start using a VPN or don’t resort to this method at all. Downloading and sharing these is punishable by law. People are always craving for new content on Netflix like The Crown, so some might download the material and share it on p2p sites. We remind you that torrenting is illegal so we don’t condone it. It’s punished in multiple countries so if you’re a perpetrator of this unlawful act, you’ll be liable to serve jail time or to pay a fine before you know it. If you still want to torrent in spite of this warning, then take the time to use a VPN for torrenting. It keeps you safe and hidden. You may already have Netflix but The Crown isn’t showing up on your list? Some Netflix content may not be available in some regions because of licensing rights. You may be excited with your newly-paid Netflix subscription but what if you get this message later on? Netflix’s subtle way of telling you that you’re geo-locked. You might not understand what this means because this usually pops up when you don’t have an Internet connection in some instances, but this is Netflix’s way of telling you that the content you’re trying to view is not available in your region. In such cases, a VPN is the only alternative you’ll need that’s guaranteed to work. If you get a VPN, it will re-route your Internet traffic to a server where the content you’re trying to view is unlocked. It’s that easy. You get to watch not only The Crown but also other TV series and movies which are limited to specific regions. Not all VPNs unlock Netflix, but here are two that do 100% of the time! The problem is most VPNs simply can’t perform. They are detected by Netflix and you’re left with nothing but wasted money and poor service. We can suggest two premium VPNs which can unblock Netflix almost anytime and anywhere. Unlocking Netflix is not a problem with ExpressVPN. ExpressVPN’s motto is all about unlocking Netflix 100%, so it’s hard to leave it out when you think of unlocking The Crown or other Netflix titles in your region. Not only that, the 24/7 live chat support will always answer your questions regarding the best servers in the world to connect, so you’re guaranteed high speed streaming with absolutely no interference. And you can even torrent without any fear of prying eyes. Talk about certified service. Prices are reasonable if you sign up for a longer subscription which is at about $8.32/month for a year. That’s a bit close to a basic Netflix subscription – but with more perks. When it comes to cheaper alternatives, nothing comes close to NordVPN. The cheapest subscription can fetch as low as $2.99/month and if you’re all for using a VPN in the long run, 3 years is a fair and safe bet. 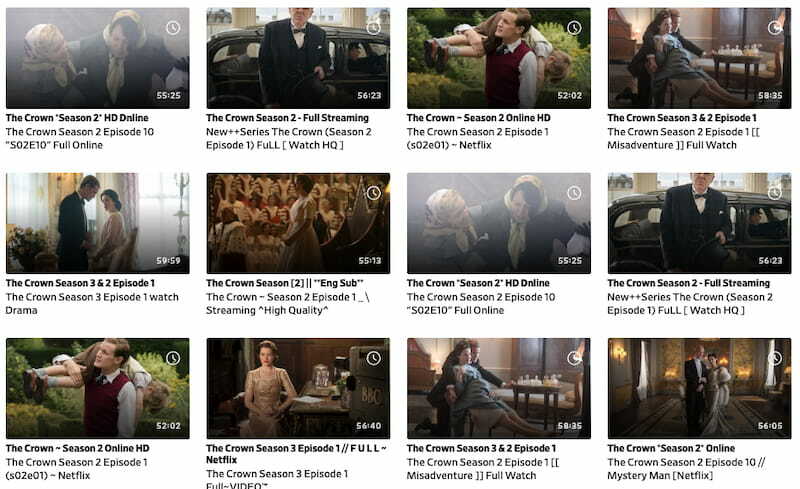 With Netflix servers in 5 countries (including the US), you can watch The Crown in absolutely anywhere around the world. This will definitely expand your Netflix library. NordVPN also allows torrenting, so you can do that without compromising your privacy. Should you keep all the pointers we’ve given in mind, you’re all set to watch The Crown. There’s no definite date in 2019 for the premiere of the third season, so it’s not too late to catch up to the Queen’s reign. As we’ve been saying, Netflix bypass is quite simple to do. Both options above offer a 30-day money-back guarantee (which we’ve also tested) so it’s risk-free. If you like The Crown, make sure you watch from the official source and support the creators.